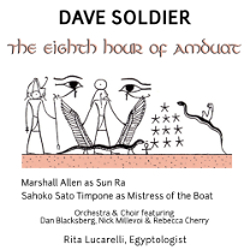 "The Eight Hour of Amduat"
Featuring the great Marshall Allen, long-time leader of the Sun Ra Arkestra in the title part, this opera for mezzosoprano, choir, improvising soloists, orchestra and electronics is adapted from the earliest surviving illustrated book and sound score. The opera was devloped with Professor Rita Lucarelli, Egyptologist at University of California, Berkley. The Book of the Amduat is painted on walls in the tombs of the Valley of the Kings and many papyri, and we use the version in Tuthmose III's tomb, who ruled Egypt from 1485-1431 BC. He is widely thought to be the Pharaoh of Exodus: if it wasn't him, it was a close relative. He co-ruled at first with the female Pharaoh, Hatsepsut, and was great grandfather to Akhenaten. He built the obelisks known as Cleopatra's Needle, one of which is on the Thames in London, and the other is near East 81st street in Central Park in New York City. Each morning, Sun Ra emerges from a hole in the east and sails on a river through our sky. After he descends he continue from west to east on the river through the underworld, the Amudat, to reemerge in the morning. Each night he dies, but is reborn in the 6th night hour when he unites with Osiris and defeats the serpent, Apep. The piece takes place during the 8th hour of the night, Mistress of deep night, in the city of the 8th hour, Sarcophagus of her gods. Sun Ra and his companions on the boat are being hauled by a choir on the underworld river. During the hour they are clothed and encounter other gods who live in ten caverns along the shore, along with living knives who defeat their enemies and four sacred rams. By earliest sound score, I mean that the specific sounds from each group of gods in each cavern of the city are described quite literally during the trip. Based in part on Colleen Manassa's article Sounds of the Netherworld, the translations of the arias to Italian and insights are from Rita Lucarelli.The score can be accessed from www.davesoldier.com. t's difficult to put into a few words exactly what this record emulates, it might well be that it doesn't sound like anything else, ever. However, the instrumentation and arrangements are both imaginative and at times brilliant. This is not a work to be regarded lightly but rather it's a brave and bold contemporary composition ironically based on the very oldest one.